The Model CSMSTRLE is a communications and control platform designed for use with Modular Controller Series slave modules. The CSMSTR uses a proprietary high speed serial protocol to communicate, via backplane connection, with up to 16 slave modules. Through the same connection, the Master also provides power to the modules. When powered up, the CSMSTR automatically identifies and addresses connected slave modules. By storing the configuration information of all of the modules, the CSMSTR is able to automatically configure modules if they are replaced. 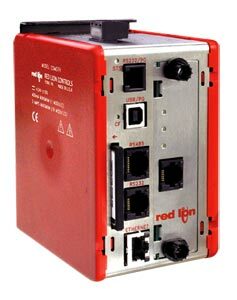 The Master provides high-speed RS232/422/485 communication ports and an Ethernet port for connection to PLCs and motion controllers. An extensive list of master and slave protocol drivers are available to allow the CSMSTR to share and exchange variable data with external devices. The 10 Base-T/100Base-TX Ethernet port can also be used to connect and share data with other devices at high speeds. The design of the Modular Controller Series high density packaging and DIN rail mounting saves time and panel space. The controller snaps easily onto standard top hat (T) profile DIN rail. The CSMSTR is programmed with Crimson software for Windows® 2000 or later platforms. The software is an easy to use, graphical interface which provides a means of communication configuration, as well as commissioning and calibration of new systems. Note: Controllers come with termination plug, terminal power block, and complete operator’s manual.